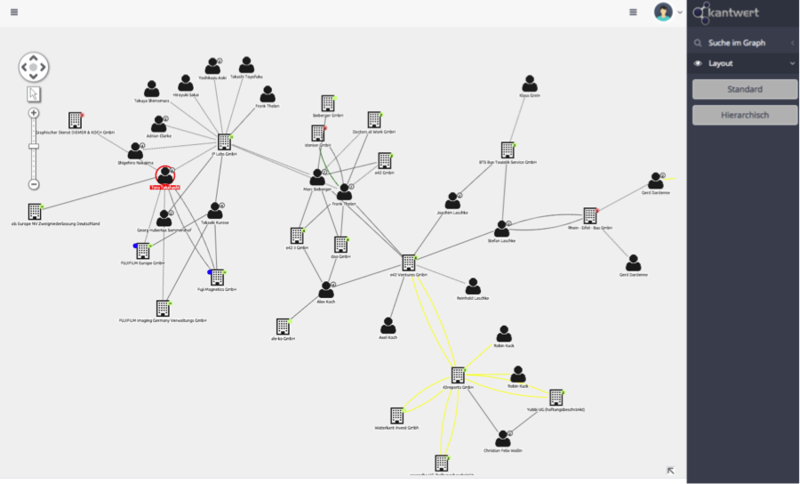 This example, showing a network of individuals and institutions, highlight’s the development team’s use of different link colors to communicate different characteristics of the data. Also note the layout options in the right-hand panel. This case study explains how Kantwert has used the KeyLines toolkit to bring even greater clarity to their data, highlighting the connections between people of power and institutions. In business, understanding connections between people and institutions can be the key to success. A clear picture of these networks of influence can provide marketers with connections to thought leaders, sales teams with a direct route to decision makers, compliance managers with more effective due diligence and researchers with a wealth of previously buried intelligence. Kantwert GmbH, founded in April 2014, is leading the way in making this data available and navigable to whole new audiences. Their unique data analysis and visualization platform allows users to search and traverse networks of directors, politicians and institutions in Germany. The database uses rule-based logic to detail 32 million relationships between more than 3.3 million people. This case study explains how Kantwert has used the KeyLines toolkit to bring even greater clarity to these networks, providing an intuitive way to interpret and navigate the complex connected data. The Kantwert team approached Cambridge Intelligence in January 2015. They already had a product with pilot customers, but were looking to upgrade the visualization component sitting at the heart of their GUI. automated layout and inability to move nodes around the chart. This limited their ability to find insight in the data. At the back-end, the platform uses a Neo4j graph database to store and traverse the connections, plus a Cassandra database to store the content for each data point, so compatibility with these systems was essential. A customizable event model, to define behavior around interactions (e.g. double-click, right-click, etc). As a start-up, Kantwert needed to make the most of their development resource. A visualization SDK, like KeyLines, would enable them to rapidly build a custom visualization solution without diverting too much development resource from enhancements being made to the Neo4j back-end. Kantwert began their evaluation of KeyLines, plus one other SDK solution, in late January 2015. “From the beginning, KeyLines was the clear choice for us. After just a couple of hours of work we were able to see our first KeyLines network chart, and had a fully functioning GUI up and running in about a month. Combining KeyLines with Neo4j was a great decision. It’s enabled us to build on the power of Cypher queries, so users can perform advanced searches and graph analysis with an intuitive KeyLines interface, and then present the results as an easy to read visualization. Kantwert released the new version of their product, incorporating KeyLines, in April 2015 – just one month after choosing KeyLines as their visualization solution. “The solution we have built with KeyLines is robust, good looking and highly performant. Our product works on a subscription basis, so it’s incredibly important our customers see the value in our platform and enjoy using it.